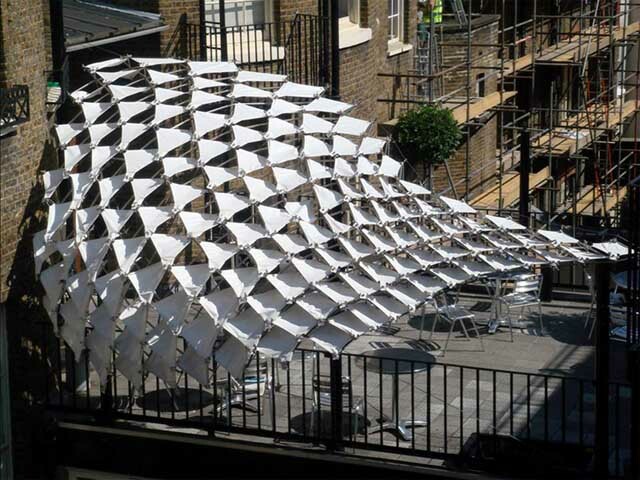 The AA Component Membrane is a permanent canopy for the roof terrace of the Architectural Association in London. 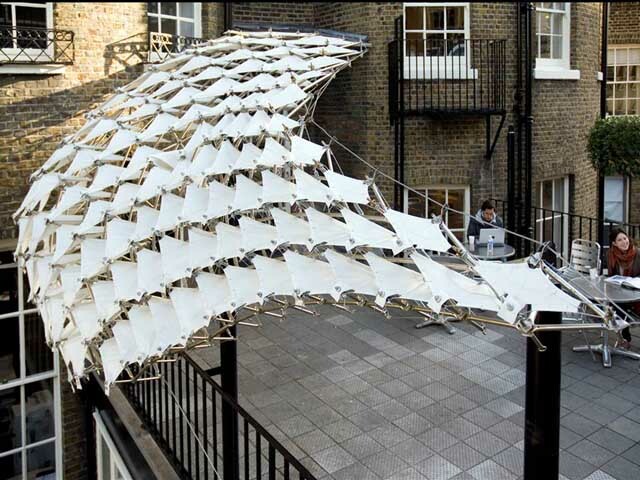 Following a commission by the AA director the canopy was designed and manufactured by EmTech in collaboration with Buro Happold in just 7 weeks. As the existing substructure of the terrace can not withstand high torsional forces resulting from wind pressure we decided to design a porous structure with a high degree of permeability for wind, light and views. The related material system is based on a simple membran component consisting of a steel framework and a membrane which acts as a loadberaing stressed skin element. The related component design evolution is mainly based on the negotiation of three critical criteria. The structural behaviour was developed with the engineers form Buro Happold in such a way that the pretensioned membrane elements become an integral, load bearing part of the system, not just a cladding on a spaceframe structure. Another important factor is the shading behaviour of the canopy in different seasons and at different times of day, and the anticipation of percepitation and the related drainage of rainwater across the porous surface articulation, which was also digitally simulated and tested. 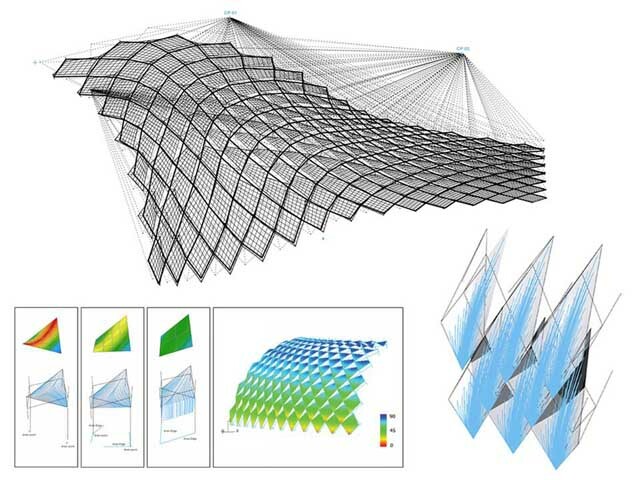 Thus the parametric model becomes the interface for a design evolution leading to a higher level of performative integration while at the same time it also derives all relevant data for the manufacturing and assembly of the steel structure consisting of 600 geometrically different parts and 150 different membrane elements. The resulting overlapping membrane articulation protects the terrace from rain while at the same time remaining porous enough to avoid excessive wind pressure or blocking the view across London’s roofscape. Furthermore the membranes contribute considerable to the stiffness of the overall structure.